It’s day 23 of a second special session in Olympia, since legislators couldn’t agree to a state budget before the end of the regular session. Now they have only 16 days left until the new two-year fiscal term. It will be hard to start that without a budget! The cause for delay is a disagreement over how to increase funding for the state’s paramount duty: public education. Republicans have proposed increasing property taxes in cities; Democrats have talked about a carbon tax or a capital gains tax. Gov. Jay Inslee suggests a sales tax on goods purchased online. But none of those measure has enough support to pass. That leaves us with the status quo — which is convenient for avoiding tough political decisions, but atrocious for our kids and schools. The state Supreme Court ruled in 2012 that the state was guilty of underfunding education. Two years later, the court found the Legislature in contempt for failing to remedy this constitutional violation. And in 2015 the Court imposed a $100,000 per day fine on the Legislature for their failure to act, which now totals $67.1 million. The Legislature has already put a plan for fully funding education into law, but they haven’t given themselves the tools to fund it. Unable — or rather, unwilling — to remedy that fundamental problem, some are now trying to pretend it no longer exists. Both parties have touted the improvements to education funding in the last few years. But it’s like having a house with a leaky roof, then patting yourself in the back for putting on a new coat of paint: the reality contrasts with the rhetoric. 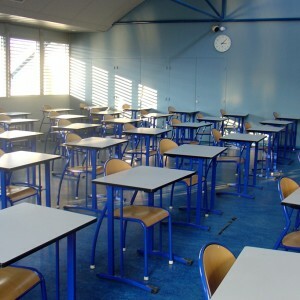 In terms of quality, Washington’s K-12 schools lag behind 19 states, according to the Education Week Research Center: Massachusetts, New Jersey, Vermont, New Hampshire, Maryland, Connecticut, Wyoming, Pennsylvania, New York, Rhode Island, Minnesota, Wisconsin, Maine, Virginia, Illinois, North Dakota, Iowa, Delaware, and Nebraska. Part of those states’ success is their ability to maintain smaller student-teacher ratios: an average of 13 to 14 students per teacher. Washington has the seventh-worst ratio in the nation, at 19 students per teacher. The only way to fix that is to hire more teachers. And that requires money. What would it take for our state to have class sizes like the states ahead of us? About $1.35 billion a year — but only if we could attract more teachers at current salaries! Washington teachers are paid about 10 percent less than the national average, so we’re not attracting new talent. A beginning educator now earns only $35,700, even though the Legislature’s own technical working group recommended a starting salary of $54,000 next year. Raising teachers’ salaries to competitive levels would mean $2 billion a year in new public investments. The Legislature is not even close to reaching those levels of funding. The core problem is that Washington state relies too much on regressive sales and property taxes, which mean poor and middle-class households pay four to seven times more of their income than those at the top. We can’t generate the revenue we need for public education with an upside-down tax system. There are some options on the table. State law currently allows the very wealthy to accrue profit through stocks and bonds with no contribution to public good. A person pays no state tax when selling high-end financial assets. A capital gains tax — 92 percent of which would be paid by those with incomes over $600,000 a year — would generate about $700 million per year. It’s nowhere near enough to cover the more than $3 billion we need to truly build a strong K-12 education system. But it’s a step in the right direction. In the long run, the only realistic way we’re going to ensure educational opportunity for all children in Washington is really a right — and not a privilege for the lucky few — is with broad-based progressive tax reform that reduces taxes on low- and middle-income families, and increases them on the rich. So far, our legislators have been loath to tax the wealthy. So we are left with this inconvenient truth: The wealthy are protected while the education of our children is undermined. The kids are not all right!